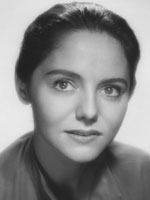 Dolores Sutton sold her first radio script to NBC in 1949 and landed a role in the same program. In her first TV appearance Jack Benny asked her age to which she replied "39 just like you." i've discovered her in "the horror within" (my favourite episode, till now) and i've just fell in love with her warm, calming, sensual, absolutely gracious voice. beautiful.